The bee is stamped onto acetate with Stazon ink, and then I used acrylic paint to colour the bee’s body and wings. Once this was dry, I stamped the entire square of acetate with Encore gold pigment ink and then dusted it with gold Perfect Pearls. The next part was the most difficult – attaching a sheet of double sided adhesive to the acetate in order to stick it to the card. I have no advice on the best method to do this, I am still trying to figure it out! 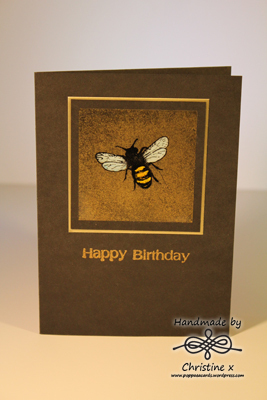 You can’t see so well in the photo but the shine on the card is beautiful and the bee really stands out. I think this works best on a dark card base to really show off the shine.